The Government is preparing a Development Bill to fast-track economic growth, aided by higher Foreign Direct Investment. 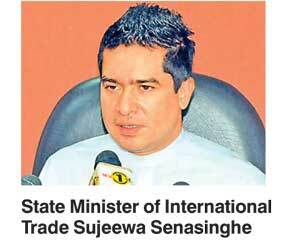 State Minister of International Trade Sujeewa Senasinghe told reporters at the weekly Cabinet briefing that the Government would continue to promote Sri Lanka to attract foreign investment. His Ministry will meet with exporters every two months to iron out issues and continue efforts to create a “one-stop-shop” for foreign investors. “The Prime Minister will soon present a Development Act to Parliament to fast-track the approval process for projects. We aim to reduce the time to just one month. Parallel to this we expect to establish the Agency for Development and Agency for International Trade in the next few weeks,” he said. The two bodies will include collaboration, support and expertise from top corporates in the private sector to provide efficient channels for investment, he assured. The Minister confirmed the Prime Minister would have discussions with Chinese officials on a possible joint venture for the Hambantota Harbour and Mattala Airport as well as broad discussions on other investment opportunities. The Government had previously announced it would enter into a joint venture with China Communication Construction Company’s (CCCC) $1.4 billion Port City project, which has already been given Cabinet approval to recommence. Wickremesinghe is also expected to promote Sri Lanka at the G7 summit, which he has been invited to attend. Senasinghe added that the Government is rolling out plans to hold a top level investment forum in Sri Lanka in October with the collaboration of the World Trade Organisation (WTO), where 200 top business delegates from around the globe will be invited to attend. During a recent visit to South Korea, Senasinghe noted he had discussions with Kia and Hyundai companies on the possibility of beginning a steel sheet manufacturing plant to supply the automaker giants. Privatisation of Sri Lanka’s troubled National Carrier was not ruled out by State Minister of International Trade Sujeewa Senasinghe yesterday, who insisted the Government was “open to anything”. The mammoth losses of Srilankan Airlines were presented in Parliament last week, with Prime Minister Ranil Wickremesinghe saying the Government would make a decision on the company’s fate in the next six weeks. However, Senasinghe said it could take three to four months for the Government to decide on its plan of action. Senasinghe acknowledged the airline’s financial losses were too large to be condoned and appealed to the people to decide whether they wanted their public money to be spent on salvaging the State enterprise. “People think privatisation is a bad thing but they need to understand that the money we are spending on keeping SriLankan afloat could be used for far more useful things. The airline only made profits when it was part owned by Emirates and it would have been financially stronger by now had former President Rajapaksa not dissolved the deal,” he said. Senasinghe also confirmed the Prime Minister was in talks with several airlines to see what measures could be taken regarding SriLankan. Additional discussions are also ongoing relating to the $2.3 billion deal to purchase aircraft signed by the previous Government. SriLankan in the 2014/15 financial year went ahead with the purchase of six A330-300s with delivery from the fourth quarter of that year, the purchase of four A350s with delivery starting from 2020/21 and the sourcing of three additional A350s on lease delivery from 2017 without Treasury support for a payment plan. As of March 2015, the accumulated loss of the National Carrier was a staggering Rs. 128 billion while SriLankan is also saddled with Rs. 76 billion in outstanding debt, according to Public Enterprise Development Deputy Minister Eran Wickramaratne last week. Of the Rs. 128 billion accumulated loss, the biggest chunk of Rs. 106 billion has been suffered in the past seven years between 2009 and 2015. The biggest annual loss of Rs. 32.4 billion was in 2014/15 while the figure has been reduced sharply to Rs. 16.5 billion in the last financial year largely owing to very low fuel prices.